The Welsh dragon is a fearsome beast, once flown on the banners of the battlefield. In Chinese mythology, dragons can control the elements and are symbols of power and strength. As The Royal Mint celebrates 50 years at its current home in Llantrisant, South Wales and continues to expand its bullion business into Asia, it’s only fitting that we release a coin celebrating the legendary creature that connects two very different cultures, revered by East and West. 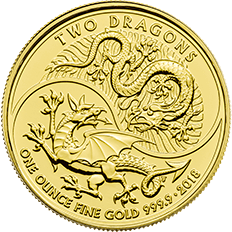 For 2018, we are excited to reveal a gold bullion coin featuring two dragons side by side. Struck in Wales, the home of the red dragon, and inspired by China, this gold 1 oz coin represents a unique collaboration of cultures and a new investment opportunity from The Royal Mint. The Two Dragons gold bullion coin is struck in 999.9 fine gold. This gold bullion coin benefits from capital gains tax exemption for UK individuals and is VAT free for non-VAT registered individuals.